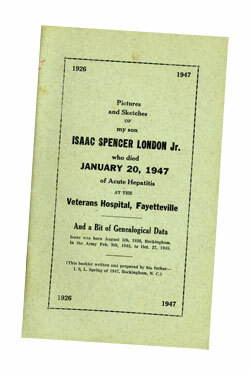 “Pictures and Sketches” was published as a booklet by my great-grandfather over 60 years ago to commemorate his son, Isaac Spencer London Jr., after he died from Hepatitis probably contracted during one of two kidney operations he had in the Army. I discovered two copies of this booklet in my grandfather’s belongings after he had passed away not too many years ago, and set it aside to cull genealogical information from it. Though I have done that, I’ve since lost the database that I entered it into, and I wasn’t able to extract but a fraction of the information in the booklet. I would have to do it again, but the concept was to preserve all of the data presented, and hopefully to make it usable for the living relatives who are interested. I do not know how many copies of the booklet have been printed, nor how many survive. There are entries in a few university libraries for the pamphlet, so a few other copies exist for sure. I have prepared this 44-page booklet (and 4-page cover) entirely with the idea of INFORMATION for our descendants. Here’s hoping it will be of value and be informative to you all in the many years far hence! —Isaac S. London, Rockingham, N. C.. June, 1947. I had to do more than just pull the names and dates again. I felt had to take Isaac’s work and make it available to everyone who was interested. Since I’m adept at both scanning and converting printed text into documents and preparing them for the web, I decided to create a website and put the entire booklet up. All of the text has been converted and initially proofed for errors, though some may still exist. I will also be making a reproduction of the booklet available through this site, for those interested in obtaining a hard copy, though every word and image has been reproduced here. A short note on formatting: I have tried to preserve some of the formatting of the booklet, retaining graphics for the page headers and placing images in a roughly analagous place. Many changes were made for ease of reading. Every page from the book is represented as an individual page of the site.